We are happy to announce the completion of our new album! “Pre sentiment” is the culmination of the musical devellopement of trombonist and composer Tim Daemen. This new album is the result of three years of musical collaboration and development of original repertoire with this jazz quartet. With his musically and blood related brother Daniel playing the saxophone, they play with lots of colours, devotion and communication. This interactive playfulness often results in spontaneus counterpoint movements, leading to new musical enviroments. Swinging, modal or avant garde, the earthy comping of Justin van Uum on bass and Achim Bill on drums brings it together effortlessly. We are proud to present our new Album “Pre Sentiment” . This album is the result of three years of musical collaboration and development of original repertoire with this jazz quartet. as we also used one of her works to shine on the cover of our cd. For this occasion only cd’s will be sold at 10€. Feel free to drop by and check out our music. Last week, friday the 4tht of November (2016) we recorded with Dada Bölüm at Topaz studio in Cologne (GER). Through concerts in the last 2 years, and having played an inspiring concert at the Pelzer club in Liege (B) a week before, there was enough material to get in the studio. Although aiming at “one-takers”, we still got some editing to do before, mixing and mastering this album. Vanaf 4 oktober staart ik weer met een 10 weken durende cursus. Als je geïnteresseerd bent om 10 weken aan je impro-skills , schrijf je dan hier in. 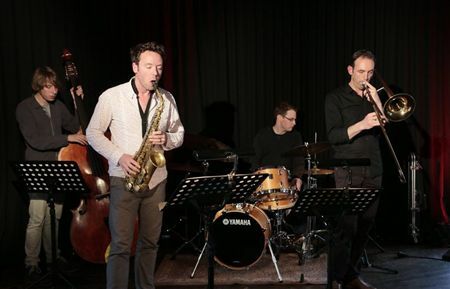 Jo Didderen (bass, compositions, bandleader), Bast Oostindie (guitar), Simon Oslender (hammond, keys), Rob Sijben (Also sax), Marc Huynen (trumpet), Jerome Cardinaels (drums), Steffen Thormaelen (perc) and myself. We are looking forward to do be playing some summer en autumn Jazz fests this year. Het Muze Jazz Orchestra (MJO) ontstond in 2010 uit de maandelijkse jams van het MuzeCafé in CC MUZE in Heusden-Zolder. Met een line-up van vijf blazers en vier spelers in de ritmesectie, houdt de band het midden tussen een klein ensemble en een big band. Binnen deze constellatie is er zowel plaats voor de individualiteit van de musici als voor het samenspel en de collectieve klankkleur van het orkest. Naast een project met muziek van Frank Zappa, heeft het MJO een repertoire opgebouwd met originele werken van altsaxofonist Lieven Cambré en pianist David Demuynck. Onder de naam Sweet Charity werd deze muziek vorig jaar uitgebracht op cd, een uitgave van RailNote Records (RN006). “They are musicians of the highest caliber and the compositions and arrangements of Lieven Cambré have one foot firmly planted in the tradition and the other pointing towards the future. They are deeply rooted while being adventurous as well. More people should hear this music,” zei de befaamde Amerikaanse baritonsaxofonist Gary Smulyan, met wie de band in 2013 samenwerkte. De band omvat enkele sterkhouders van de Limburgse jazzscene zowel als een aantal muzikanten die in Heist-op-den-Berg verre van onbekenden zijn: Lieven Cambré(°1968) en tenor- en sopraansaxofonist Koen Nys (°1965), beiden op zeker moment ook met hun eigen ensembles in de Hnita-Jazz Club. Bijzonder aan het optreden in de Hnita-Hoeve is tevens de aanwezigheid van niemand minder dan Frank Vaganée (°1966), artistiek leider van het Brussels Jazz Orchestra (BJO), op een voor hem minder gebruikelijk instrument: de baritonsax. 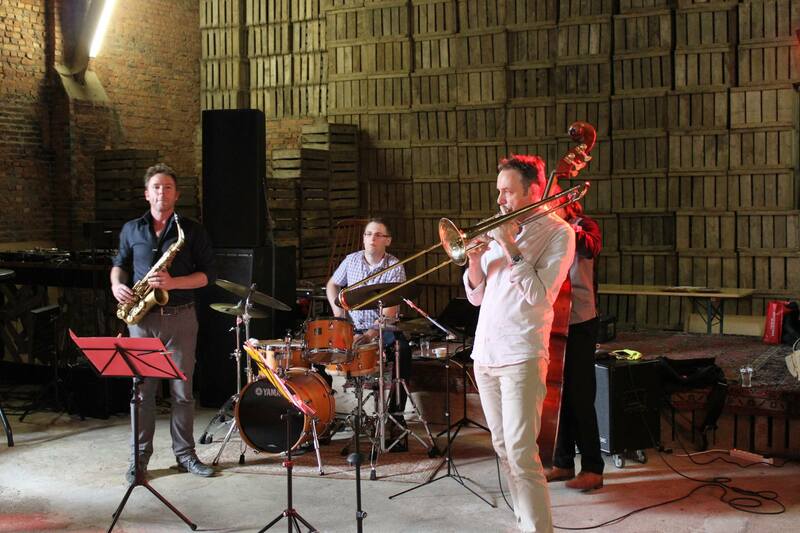 We played an afternoon concert in an old renovated farm, in Maaseik Belgium. The acoustics in this old barn are outstanding, and made our sound vibrant and warm. It is a joy to play without amplifying, filling this barn with old and contemporary tunes. Hope to play here some other time in the future. Played at the Muze cafe in Zolder with my brother Daniel Daemen , Justin van Uum and Achim Bill. We did some songs of Albert Mangelsdorffs quintet record, some from Dave Hollands record “Prime Directive, and several personal favourits. It’s always a pleasure to play with these great players in jazz spot that always makes you feel at home! Recorded November 29 and 30, 2013 at Studio Crescendo, Genk. Mixed by Rob Vanspauwen. All compositions by Lieven Cambré except 2 and 7 by David Demuynck.